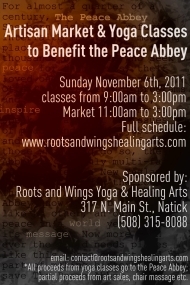 Peace Abbey Benefit: Artisan Market and Yoga Classes | Roots and Wings yoga and healing arts, Natick, MA"
Join us *on location, here at Roots & Wings* for a fundraising event to support our friends at The Peace Abbey. Yoga, full artisan market, massage, information sharing, refreshments, and lots of mingling! The fun starts at 9 am. Tarot, Reiki, Chair Massage, Angel Readings, and more available for between 15-60 minute sessions on the day of the event. To schedule a mini session for November 6th, please email contact@rootsandwingshealingarts.com. All proceeds from yoga classes and from donated items from artisans and healing arts practitioners, and partial proceeds from private healing arts sessions will be donated to The Peace Abbey (www.peaceabbey.org) to support them in their efforts to avoid closing. Please come and help our friends! Give Peace A Chance! To see bios for our instructors, click here or on names above. For a full list of Artisans, click here.